The writer and political activist who was forcibly removed from a room where U.S. President Donald Trump and Russian President Vladimir Putin were about to give a joint news conference said Tuesday he wasn't trying to protest. Sam Husseini, a contributor to The Nation magazine, told The Associated Press that he held up a piece of paper with "Nuclear Weapon Ban Treaty" printed on it to get attention so he could ask a question "on serious nuclear policy" and the nuclear arsenals of the United States and Russia. "I wasn't doing a protest," Husseini said in an AP interview. "I simply wanted to hold up a sign so that they would call on me." "Nobody is talking about the fact that Putin and Trump are, in effect, using their nuclear weapons for their own geo-strategic interests and threatening humanity with it," he added. "I felt this was an important thing to raise." Husseini said he also wanted to ask Trump about Israel, maintaining no U.S. president has acknowledged the widely held assumption that Israel has nuclear weapons. Israel neither confirms nor denies it has nuclear arms. "If he'd said yes, that would've been a serious move towards global peace because we can finally talk about things in an open manner," Husseini said, adding that the U.S. has followed Israel's non-acknowledgement policy on the issue. Finnish police said Husseini was removed from the room at the Presidential Palace in Helsinki and detained for interrupting the packed event, which was being covered live. He was released later Monday. Husseini said police cuffed both his hands and legs and whisked him away to a downtown detention center for questioning. 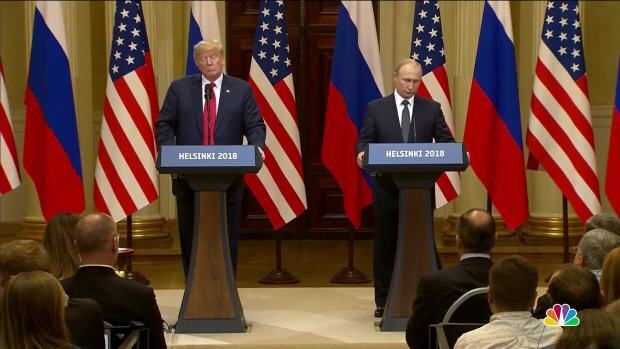 Helsingin Sanomat, Finland's biggest daily newspaper, said Husseini allegedly shouted comments to U.S. journalists and disrupted the live broadcasts they were doing while awaiting Putin and Trump. CNN White House reporter Kate Bennett tweeted amid Monday's commotion that Husseini had spent hours at the palace's press area "passing out literature to us and generally hanging around." Along with writing for magazines, Husseini works as the communications director at the Institute for Public Accuracy, a Washington-based group. CORRECTION (July 18, 2018, 2:26 p.m. ET): In a story July 17 about the writer who was forcibly removed from the room where the U.S. and Russian presidents were about to give a news conference, The Associated Press incorrectly quoted Sam Husseini's explanation of the paper he held up at the time. Husseini told the AP he wanted to ask a question "on serious nuclear policy," not "on Syria's nuclear policy."